Does the Democratic Party in the USA Have a Death Wish? In the aftermath of the US presidential and national elections in November, 2016, I’ve seen many arguments put forth by The Far-Left Democrats trying to make it appear that they didn’t suffer the crushing defeat that they actually experienced. As Donald Trump is becoming the next president of the United States, it seems this post might be a appropriate time to expose some of the arguments that have been put forth. Not only will this, I hope, be of interest to readers of this blog in distant nations, but to Americans as well. First, let’s see what the Democrats have done in the aftermath of their electoral defeat. What has been one of their defining moments so far in projecting their party to the nation? 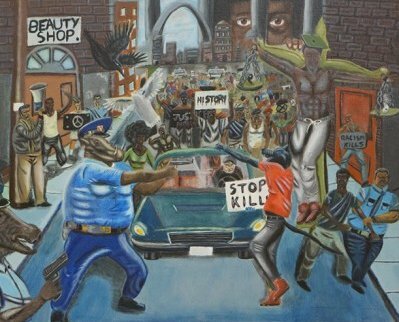 Congressional Democrats have made it a major point to be able to be able to display a painting in the US Capitol complex which depicts American law enforcement officers as pigs (first link). Republican Congressional representatives were (justifiably!) outraged and had it removed. Democratic Representatives put it back up, and the cycle repeated for a while. That Democrats would paint themselves as the party that favors depicting police officers as pigs shows breathtakingly bad judgment. This story can only reinforce the pro-Republican sentiment of many American voters who heard of this bizarre, anti-police action by Democrats in the US Congress. Does the Democratic party have a political death-wish that it behaves so badly? The Democrats need a new party chairman and one of the early favorites for the position was Rep. Keith Ellison of Minnesota, who is a Muslim. Deeper investigation has shown that Rep. Ellison has had a long association with the Nation of Islam’s Louis Farrakhan, a virulent anti-Semite (second link). Exposure of this link may torpedo Rep. Ellison’s efforts to be Democratic national chairperson, but that is by no means certain in a party that seems determined to make itself a diminishing party in the US national election landscape (third link). How bad was the steady deterioration of the Democratic party in US politics under President Obama? It was unprecedented. During Obama’s eight years in office, the Democratic party went into freefall. When Obama came into office, it had the presidency, the US Senate, the US Congress and a majority in many state political offices across the USA. Now it has lost control of the presidency, both houses of the US Congress and the Republicans have a huge lead in controlling state governorships. Even more revealing is the extent to which the Democratic party has been rejected in the state legislative races across the 50 states. See the fourth link and fifth link for an in-depth discussion of how massive has been the Democratic downfall across America. I’ve seen media articles that the Republican dominance over the Democratic party is now greater than at any time since either 1920 or just after the American Civil War. The Democrats draw comfort from reports that Hillary Clinton won the national popular vote by several million votes over Donald Trump even as Trump won a decisive vote in the Electoral College tally. That the reported national popular vote favored Clinton is true, but very misleading. What follows is an analysis of the vote that you may not have seen. The sixth link includes a map of the counties won by Trump in red and the counties won by Clinton in Blue. As can be seen, Trump’s geographic and regional victory was immense. The map indicates that while the Republican party has national appeal, the Democratic counties are increasingly limited to the nation’s large cities and a few other regions around the nation. The founding fathers who wrote the US Constitution wrote it in such a way that the USA would not become a “mob-ocracy,” dominated by the large populations of the big metro areas. Their wisdom was made evident in the 2016 elections. However, the popular vote totals of the 2016 elections were skewed by several factors–some known and some likely. Let’s look at California’s vote. The Democrats in that party rigged the primary process there to almost guarantee that Republicans cannot even be on the ballot for a Senate race. The seventh link has some insightful statistics and observations. It shows that over seven million Democratic votes were cast in the California senate race between two Democrats–this radically affected the national popular votes for both the national senate race vote totals and the presidential race. Since no Republican was competing for a statewide senate race in California–by far the USA’s most populous state–the national popular vote total for senate races was an illusion. Millions of Republicans knew that Clinton would win California and that also had no candidate to vote for in the statewide senate race, so they had no reason to vote at all, unless they were in one of the few competitive congressional districts in California. The Democrats had a competitive senate race, so many millions of Democrats turned out–inflating the national senate popular vote totals. It also affected the national presidential popular vote. Since millions of California Republicans had no reason to vote at all, this worked to give Hillary Clinton the illusion of a national popular vote majority. The eighth link gives the final senate vote tally in the California senate race as totally over 12 million Democratic votes! That accounted for not only a large popular vote majority for the total vote in senate races nationwide, but it caused Clinton to roll up millions of votes in California because Republicans there had little or no reason to vote. Another reason for the anomaly in the total nationwide vote for senate races is that only one third of the US Senate races were contested and which states are holding senate races in any given year affects the national popular vote totals for senate races. In 2016, the massive Democratic states of California and New York had senate races (with three of their four main candidates all being Democrats) so that greatly inflated the Democratic vote totals for senate races. The huge Republican state of Texas, for example, had no senate race, so its votes were not included among the senate popular vote totals. A third reason why Clinton had a popular vote majority was the number of illegal votes that were likely cast in the election. Many large cities have declared themselves to be “sanctuary cities,” which choose to break federal immigration laws and shelter illegal immigrants. Some give illegal immigrants driver’s licenses, which is a ticket in some states to gaining voter status. Any serious effort to ensure the integrity of the national elections in the US would require a rigorous effort to purge illegals from all voting rolls. Another reason inflating Clinton’s popular vote total was outright fraud by Democratic insiders in the large cities. In the recounts that were done in Wisconsin and Michigan at the behest of Green Party candidate Jill Stein and the Clinton campaign, it was demonstrated that there was extensive vote fraud in Clinton’s favor in Wayne County (Detroit) as local election officials counted Clinton votes multiple times to inflate her totals illegally (ninth link and tenth link). How many other American metro areas (where Democrats typically control the precinct and vote-counting officials) also inflated Clinton’s vote totals as was done in Detroit? To be fair, it should be noted that while the Detroit vote was shown to have considerable fraud, the Wisconsin recount showed honest counting of all votes throughout the state so Milwaukee’s vote was shown to be honest. The eighth link offers a vote total that is most instructive. While only one-third of US senate seats were up for re-election, all the US Congressional seats were up for re-election so the total national vote for those races will be far more of an indication of the real result of the 2016 election that the senate vote totals. It reports that the total Republican national vote for Congressional seats exceeded the total national vote for Democrats by 3.1 millions votes. That shows who won the 2016 American elections. Another reason for the downfall of the Democrats is that the national polling entities are conducting dishonestly-reported polls. They routinely skew polls to favor the Democrats–lulling Democrats into thinking they are doing much better than they really are. Pollsters made massive errors in predicting the outcomes of the Israeli national elections, the British national Parliamentary election, the British Brexit vote and the US presidential election. In every case, they overstated support for the leftist/liberal side and understated the support for the conservative/rightist side. You would think that they would learn their lesson, but they haven’t. The final link shows that two recent national polls on the popularity of incoming president Donald Trump were rigged to make him look less popular than he really is. They severely downsized the number of Republicans whose views were reported in the polls, lowering the Republican participation to just 23% of the overall sample in one of them. To be accurate, they would have had to dramatically increase the views of Republicans in the reported poll, but that would make Trump look good so they chose to skew the poll’s result with deceitful statistics. The polls are so badly skewed in favor of liberals/Leftists that I wonder why anyone takes them seriously anymore. One thing is certain. The Russians didn’t “hack” the election or change a single vote in the US election. The recount in Wisconsin showed zero interference by the Russians (or by anyone else) in the vote. The Russians very likely did hack the internal communications of the Democratic National Committee, but then the DNC’s computers were reported to be so easy to penetrate that it is almost certain that many other nations and entities were “reading their mail” as well. Hacking into the personal emails between Democratic officials does not constitute “hacking the actual election” in any way. Donald Trump won the US presidential election “fair and square.” This enrages the liberals and leftists, who have been throwing a collective tantrum trying to de-legitimize Trump’s win. In conclusion, the Democratic party is in a steady and growing decline. They are trying to justify their losses, but they refuse to face the glaringly obvious reason why they keep losing. They have moved so far to the left that they have increasingly ceded the center of the American political spectrum to the Republicans. Increasingly, the Democrats have the leftist vote and the Republicans have the centrist and conservative votes. As long as the Democrats continue to kowtow to a whack-job leftist agenda, they will continue to lose American elections. To survive, they must move toward the center of the political spectrum. If they continue to slide toward the extreme left in American politics, they could go the way of the WHIG party, which was once a force in American politics and elected several presidents. The Democrats are so heavily-supported by the whack-job left that is dominant in the big cities that they will surely win those areas, but that will make them only a regional party, not a national one. I’d like to thank a reader for sending me the last link.